Originally from upstate NY, Dr. Matthew Gellert attended the University at Buffalo for his undergraduate studies where he majored in Biomedical sciences. He stayed in Buffalo to attend the University at Buffalo School of Dental Medicine where he received his degree with honors in 2011. After Dental school Dr. Gellert completed a one year AEGD residency at the VA hospital here in Buffalo. In his free time Dr. Gellert enjoys reading, listening to podcasts, skiing, and cooking. Brandi-One of our awesome hygienists! Brandi has been with us since 2011 and is available Monday-Thursday. Lorraine joined Altman Dental in 2016, but has worked as a hygienist since 1998. Lorraine currently serves as an educator for the Erie Community dental hygiene department. Melanie is our Office Manager and has been with us since 2005. Melanie keeps our practice moving and in top order! Nkiki: You'll see her at the front desk & she handles our insurance claims and questions. Sheryl is our Clinical Operations Director, and works as both Dr. Altman and Dr. Muto's chairside assistant. She has been with Dr. Altman's office since 2005. Sharon joined the Altman Dental team in 2016, and works chair side assisting Drs. Altman and Muto. She has worked as a dental assistant since 2009. Holly Sue joined the Altman Dental Team in 2017, and works chair side assisting Drs. Altman, Muto, and Maria. She has worked as a dental assistant since 2011.
" I was referred here by a friend and am so glad I was. The entire staff makes you feel appreciated and shows attentiveness to the quality of your care. I recently needed an emergency appointment and they accommodated within hours of opening. I'm always eager to recommend them anytime I hear someone mention needing a dentist. 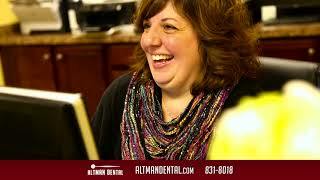 At Altman Dental we strive to provide our patients with the best and most complete dental care. Our doctors and staff frequently attend continuing education seminars to learn the latest dental techniques. Here are some of the services we provide, please click here.